Is it possible that the majority of illness originate from something as simple as dehydration? Could we be treating ourselves with medicine when we should just be drinking more water? 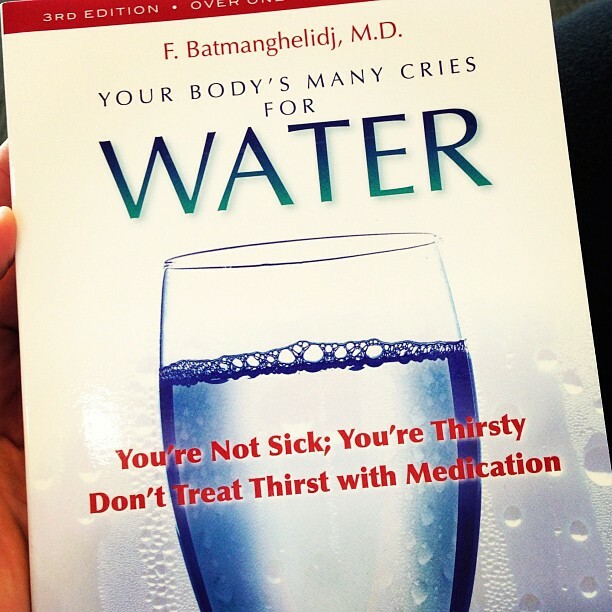 I recently read Your Body’s Many Cries for Water by F. Batmanghelidj, MD, which explores this possibility. Our body is made up of 75% water, and in particular, our brain tissue is 85% water. Adequate hydration is essential to our bodies and brains functioning properly to stay healthy. But many of us are suffering from chronic dehydration because we live in a society where coffee, tea, alcohol and manufactured beverages like soda have become acceptable thirst-quenchers. While many of these contain water, they also contain dehydrating agents that only make our body’s more thirsty. And, sodas, in particular, are addictive (both the caffeine and sugar), taking away our natural thirst for water, even when it’s plentiful and available. Morning sickness during pregnancy is the main indicator of a baby and mother’s dehydration. Water is essential to cell expansion during a baby’s first stage of life. Chronic pain is a huge indicator of thirst. For a while, painkillers may work for pain monitored by the central nervous system, but eventually the brain will become so dehydrated that it will register all pain until it gets enough water. And, until it does, the pain will increase and the body will limit the mobility of those areas in order to “prevent the production of additional toxic waste” that water, if available, would wash out. If you are experiencing consistent back pain, leg pain or headaches, take note. Dyspeptic (gastritis, heartburn, constipation) pain is an emergency thirst signal. “Digestion of solid foods depends on the presence of copious amounts of water” and “water provides the only natural protection against the acid in the stomach.” Antacids contain a lot of aluminum (so does your deodorant, by the way), which combined with brain cell dehydration are proven causes of Alzheimer’s disease. Stop popping those antacids and drink a couple glasses of water instead. “Fully 75 percent of the weight of the upper part of the body is supported by the water volume that is stored in the disc core.” While proper posture is helpful, adequate water is essential if you are experiencing back pain. Exercises that stretch the back and help “vacuum” water back into the disc space will help both neck and back pain. I personally find that laying on the bed with my head off the edge for a minute or so helps a great deal. Of course, my chiropractor adjustments help tremendously as well. Dehydration affects the regulation of body temperature. Many migraines and headaches are caused by “heat stress” because of dehydration that may occur due to lack of drinking water, drinking alcohol, or an allergic reaction that releases histamines (blocking hydration). Dehydration leads to stress in the body and causes hormones to go into crisis mode. As a result, dehydration contributes to chronic fatigue syndrome and depression. Using caffeine to override your body’s available energy will lower levels of stored energy, meaning that your hormones will not be able to react appropriately later and the brain has less energy to work from, leading to less focus and attention span. This dehydration effect is exacerbated when elderly people with memory problems or children with learning disorders drink anything other than water, especially soda. Adequate water and salt intake are essential to maintaining blood volume that prevents hypertension. The body will do all it can to retain water and sodium (helps balance water in and out of cells), yet the current “treatments” for hypertension prescribe diuretics. Water is the best diuretic – if you are drinking enough water, your body will respond and eventually flush out the toxic edema fluid rather than the water your body desperately needs. Cholesterol is essential to the function of our cells because it helps our cells retain water. In the state of dehydration, you will develop high cholesterol as its working in overdrive to prevent cell dehydration. “The sensation of thirst and hunger are generated simultaneously to indicate the brain’s needs.” We cannot tell the difference, and thus often overeat when our body’s are really just crying out for water. Then, dehydration causes our brain to crave more energy, thus causing us to crave sugar. So, we overeat, eat unhealthy foods and gain weight simply by being dehydrated. In some cases of chronic dehydration, our brain begins to inhibit insulin so the pancreas can provide water for food digestion – a crucial function to provide energy to the body. Ultimately, this can cause insulin-independent diabetes, and instead of drinking more water & eating a balanced diet to get the body to behave normally again, people take chemical override medications to force the body to produce more insulin. Salt is crucial to ensuring we have an “ocean” of water outside our cells, but the table salt we eat in most foods is a chemical and not mineral-rich. Remove sodium preservatives and table salt from your diet and replace with unrefined sea salt to keep your body’s hydration in balance. The simple way to prevent the damage from chronic dehydration is to drink enough water. Your body needs a minimum of 8 glasses of water per day, more, especially, if you are drinking alcohol or caffeine. If your urine is not colorless, you are not hydrated enough. Drink water slowly, throughout the day. I typically drink a glass of water before and after each meal, and then at least one in-between each meal as a rule of thumb. If I am feeling sick, my allergies are flaring or my back pain returns, I immediately drink lots of water, and only water, until the symptoms pass. I have truly noticed a difference. Are you drinking enough water? If any of the above dehydration-related illnesses stuck out to you personally, you must read this book . It has very detailed chapters on each of the effects of dehydration and testimonials for how water has healed people. Go read it (or borrow from me!) – it’s fascinating!